This PMR report on peppermint oil analyzes the market opportunities, current updates, and insights about the various segments of the global peppermint oil market during the forecast period 2018-2027. This report includes the macro and microeconomic factors and the outlook on the peppermint oil market. The current study reveals the peppermint oil market trends and market dynamics in five major regions - North America, Europe, Latin America, Asia Pacific, and the Middle East and Africa. The report highlights the drivers and restraints of the global peppermint oil market, and their influence on each region during the forecast period. This report also includes the study of current trends and opportunities for peppermint oil. Peppermint oil is an extract obtained from various parts of the peppermint plant. Peppermint oil is obtained by the steam distillation method just before the flowering stage. Peppermint oil is used in the food & beverage industries to impart natural mint flavor to various beverages, ice creams, sweets & desserts, as well as confectionary items. The cosmetic industry utilizes peppermint oil on a vast scale in body lotions, moisturizers, and different creams. The use of peppermint oil has increased in aromatherapy for its relaxing and memory boosting effects, as well as painkiller properties. Peppermint oil is used in home products such as air diffusers, room fresheners, and sprays, as well as in personal care products such as toothpastes, shampoos, soaps, mouth fresheners, etc. The use of peppermint oil is expected to increase in the food & beverage and aromatherapy segments during the forecast period. The demand for peppermint oil is expected to increase in Asia Pacific at a CAGR of 5.3% during the years of the forecast period. 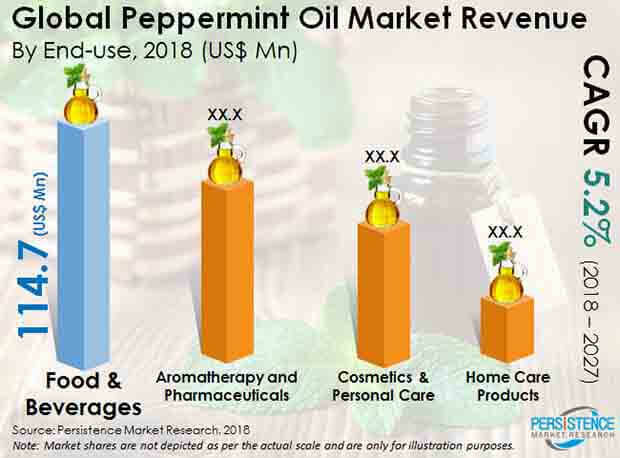 The increasing demand for products imparted with natural and organic ingredients, along with increase in the use of home and personal care products by consumers with changes in lifestyles, and increasing per capita income is proving to be a driving factor for the peppermint oil in Asia Pacific. Among the nature segments in the peppermint oil market, the organic peppermint oil segment is expected to register the highest growth rate of around 7.5%, with the increased consumer demand for natural and chemical-free ingredients. However, the conventional peppermint oil segment had the highest market share in the year 2017, owing to its accessibility and lower cost. The rising awareness among consumers about health issues caused due to the consumption of products with chemicals and artificial flavors is driving them towards various natural products. Peppermint oils are natural, and are used to impart aroma and flavor to various food and beverages. The 'move to natural and organic formulations' trend is expected to grow. Thus, the demand for food and beverage products with natural ingredients such as peppermint oil is expected to grow during the forecast period. Aromatherapy is the use of aromas from natural substances for the treatment of various physical as well as emotional conditions. The aroma of natural and therapeutic oils has many benefits on various mental and physical health issues. Peppermint oil is used in aromatherapy for various purposes such as massages, inhalation, bathing, perfumes, etc. Peppermint oil is known to reduce anxiety, vomiting, and pain, as well as raise alertness and improve memory. Peppermint oil blends well with most essential oils, and hence, is preferred in most of the essential oil blends, as it helps enhance stamina and alertness. There is growing demand for peppermint oil as a result of the rising preference of consumers for natural alternatives in place of synthetic and chemical treatments. The growing preference of consumers for aromatherapy is expected to be a prominent driver for the peppermint oil market. Home care products have increased in demand due to the rising consumer preference for cleaner, safer, and refreshing homes to live in. Peppermint oil is the perfect candidate to be used in home cleaners, as it is a good solvent, and gives out a mint fragrance that freshens the entire house. Peppermint oil has a cooling effect on the skin, also promotes blood circulation, thus enhancing the skin. Peppermint oil is thus used in various body and hair care products as a replacement for various synthetics. The anti-bacterial and astringent properties of peppermint oil adds value to the product. Peppermint oil is also used in various oral care products for a freshening effect. Peppermint oil is known as a great insect repellent, and hence, is used in various insect repellents, formulations, and creams. The growing occurrence of diseases such as dengue has boosted the demand for mosquito repellents with natural active ingredients like peppermint oil. Peppermint oil is known to improve digestion and helps in irritable bowel syndrome. Peppermint oil has various therapeutic properties, and is helpful for health issues such as IBS, heartburn, indigestion, nausea, morning sickness, menstrual problems, cold and cough, inflammation in the mouth and throat, etc. Peppermint oil is inhaled or directly ingested in small quantities in order reap its therapeutic benefits. Dietary supplements are added with peppermint oil to increase its therapeutic value. Due to all these factors, it is expected that, the global peppermint oil market will increase positively in terms of value and volume during forecast period.